The latest scoop and rumors on the 2 Mass Effect Movies suddenly announced. One has already begun production. The other could be the most expensive 3D movie ever made. The first Mass Effect movie is rumored to star Clive Owen as Commander Shepard. This version will be rated R and directed more to the average gamer. The story takes place right after the end of Mass Effect 3 and will have a lot of focus on action. EA says: "This is because the end of Mass Effect 3 didn't actually mean anything. There will be a huge space battle at the end of this movie." This Renegade Commander Shepard will be a soldier and only fight with guns. The back story is that this Shepard was full on Renegade and that everyone he crossed paths with that he could piss off or kill, he did. Filming is to start 1 year from today and the release date has not been revealed. The second Mass Effect movie will star Lucy Lawless as a Paragon Commander Shepard. This version is rated PG-13 and will be more for you Twilight Jimmys. Dubbed "The Paragon Version" immediately went into production after the Hunger Games made like $150 million the first weekend. Expect to see a lot of story and more emphasis on how difficult it is to make some decisions while in space. EA says: "Expect this Shepard to be a 'Galaxy Gal' that everyone admires. A real role model for young girls." This Shepard will be an Engineer, specializing in tech gadgets and computers. Rumor: she even flies the Normandy at one point. The deal with this version is that it's going to be the exact opposite of the "Men's" version. So this Shepard is going to have all the support in the galaxy. There's potential to see Wrex and some of the other characters that will be dead in the Renegade version. Seth Green has already signed on to play Joker in Both movies. The Chick who plays Whitney on NBC will play Miranda in the Paragon Version. Michael Clarke Duncan & Ving Rhames will both play Krogan's in the Renegade version. Justin Bieber will be Kadien Alenko in the Paragon version. Do you like DoA? Have a PS3? Is it hooked to a 3D tv? If so I have some good news for you. It's been a while since the last Dead or Alive Beach Volleyball gave you jimmys carpal tunnel, but this summer you'll get another chance. With Yoshinori Ono temporary leaving his position as Street Fighter Producer due to his current health condition, Capcom was working hard to find a replacement while Ono recovers. Today, they announced that Katsuhiro Harada will be taking over as the new producer of the Street Fighter series. He'll be doing this position while keeping his current position as Tekken's Producer. Expect him go to Capcom wearing his signature karate Gi from time to time. What will his first decision be for the Series? to make the next big Street Fighter game feel more like a Tekken game, he said in an interview. He hopes to bring out a game in the Street Fighter series that both fans and veterans will appreciate in the coming future. He also want to let everyone know that until Ono has recovered and takes his position back, He'll has his Zaibatsu men take control of the day-to-day operations of the company. Will this move make Street Fighter better, or will Katsuhiro cause the doom of the Street Fighter franchise? Let me know what you think? Leave your comments in the bottom. Vote, and Don't be a Jimmy! 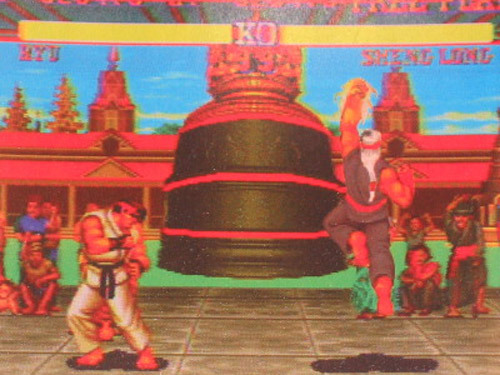 Remember Sheng Long in the EGM from like 20 years ago man? Yeah, something like that. The best "fake" stories will be rewarded with 1600 MSP or $20 PSN cash. Don't be a Jimmy! Who will come up with the best fake video games news or rumor? Before you get any ideas, check out the last couple of years. Don't do something that's already been done. You can use images and video if you like. The more believable the better. Make sure you share your story on our Facebook page, tweet us @goukinews, leave a link on our Raptr page. The more votes, comments and shares for your story the better. IF there are good enough stories Gouki.com could select multiple winners. There are no limits on how many winners there can be. There are no limits on how many entries you can submit. We're not guaranteeing a winner either. Make sure you tag your story "AFD-2012." Stories must follow the FAQ guidelines and be approved by Gouki.com.